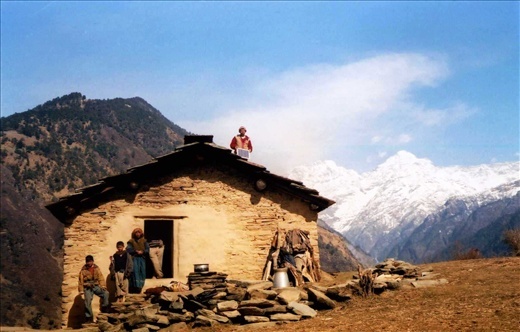 Thanks to the financial support of the World Nomads community, PEAK installed Solar Home Lighting systems to over 70 more homes in the Kumaon Himalaya, India. After the success of the Khati lighting project, PEAK embarked on the installation of further units into another administrative district called Waucham. Within this district, the village of Jatoli, Libhurgur and Dhoor became connected to the sun and thanks to increased purchasing power of the strengthening Australian dollar, the houses within Muladhooor, Shilshor, Okhalia, Ritang & Jhagai also got wired to the solar grid. The time lag in bringing the basic essential of light to those in darkness was glacial even in retreat. We would like to take this opportunity on behalf of PEAK to apologise to the recipients and donors alike However, these houses were 'out there' in terms of their isolation from each other and topographically challenging for those whom spend most of their time at sea level. Political logistics was another factor - with India coming in at 136th globally with ease in which to do business in, we take small solace in being able to trek there let alone provide light! This project was exceptionally heart warming, life affirming and gratifying. Two local community members were employed for the installation process at each of the two work sites. Jai, Dhan, Digember and Dayal worked on the villages proximal to their own home and their indigenous knowledge was invaluable. Transportation of the goods varied depending upon location, for the houses of Dhoor, Muladhoor, Libhurghur, Shilshor, Okhalia, Ritang and Jagai the solar units were collected every morning from the PEAK building by our 'backpack wearing' installers Dhan & Jai to carry to the work site. The Jatoli units were transported from Khati to Jatoli by nine mules over 7 'Himalayan' Kilometres. In intermittent snow and sub zero temperatures (-8 degrees) our employees turned up early on the allocated day with big smiles and plenty of warm clothes 'ready for action'. This set the tone for the entire project that took on a jovial atmosphere at each household with hospitality being overwhelming. During the implementation phase, that spanned over a period of time through winter, the weather remained icy with predominantly clear skies but with periodic snowfalls. Scott spent time shovelling snow off the bathroom roof of the PEAK building so the next load of batteries could be fully charged in the sunny breaks for the next days work. During the implementation of the Khati Solar Home Lighting project (2009) many lessons were learnt. Previous experience had seen males make the major decisions on solar installation (ie: where the unit/lights would be placed in the household),on follow up monitoring we also noted the systems had been tampered with or rearranged for a variety of reasons. It was of particular importance to have a female staff member present during the installation process to ensure that the women who are often the main beneficiaries of the lighting for household tasks had a 'voice' on the placement of lights. This enabled the women to express their opinions in front of other household members which had a positive influence. As a result lights were positioned in appropriate key areas with the small night light frequently requested to be installed in the cattle shed beneath the house for the ease of milking livestock. Other minor but important points included attaching clear plastic bas over the lens of the bulb with rubber bands to ensure there was no smoke damage from open fires used for cooking. The new solar units included torches which proved to be an exceptionally popular item for negotiating rocky paths between houses at night. And the inclusion of mobile phone charging outlet should negate any possible tampering of the battery to charge the male family members phone! All packaging (i.e. cardboard, polystyrene etc) from the solar units was sorted into different categories for use in primary school Art classes in Khati, with all non reusable items burnt on site. The kids had great fun painting up the plain white cardboard boxes the lights came in and the thick cardboard used for separating the solar plates has been used for chum shum sitara (glitter)art all popular take home items. PEAK now has enough recycled resources to utilise for various projects into the future. For the project to be a complete success the employment of a 'solar technician' was paramount. PEAK found a willing participant in one of our employees - Digember - who imbibed every word on solar, was keen on all aspects of the job & kept his won system scrupulously clean with a special 'cloth hat' for his battery - we knew this was the man for the job! This project included a financial allocation for the maintenance of existing Khai Solar Home Lighting Systems. Undoubtedly, the key to the overall success of this project has been due to PEAK's monitoring of the project and Scott's dedicated work in trouble shooting issues both big and small as they arose. The local predilection for 'having a go' and attempting to charge mobile phones off the batter (fortunately this issue has been ameliorated with the new systems mobile phone charging capabilities) proved disastrous on several occasions leading to the total 'rebuild' of several systems. The purchasing of spare batteries, lights and extra cable and motherboards made this all possible. Sadly, the new systems did not cater well for a well know Finnish mobile phone company which saw many hours of retro fitting compliant charger plugs. Similarly, the torch charger cable was of inferior quality and subject to failure within 7 days of use, so again many hours were spent on the soldering iron and many metres of solder later (read 4 months) replacing them with stranded copper wire. Scott doesn't want to smell molten lead and tin for some time, allowing for some brain cell repair! Jatoli is situated on a steep slope and it was amazing to stand at the bottom of the hill at night and see the warm glow of dotted lights emanating through doorways or windows. Some community members find it almost impossible to pay for kerosene for small lamps, so to be invited into houses that have never had the basics most of us take for granted - light and see the look of wonderment and joy at being able to see all corners of the room albeit unswept for the first time (causing much consternation) and each other were the sort of moments that saw a welling of emotions. This project had very clear cut outcomes. Proper lighting is essential to the running of any household and the Solar Home Lighting Units have 'eased' the burden of purchasing kerosene, provided an efficient low maintenance lighting source to every household for daily chores and children't night time studies and has paved the way for any future micro enterprise projects. This project will continue to be monitored by PEAK staff. We were able to impart important technical 'knowledge' to our new solar technician. Digember is keen, mature, previously unemployed and we worked well together. Ideally, we would love to alleviate PEAK as the first point of contact for any maintenance issues and transfer the role to Digember with appropriate remuneration rather than an ex gratia payment. At the commencement of this project, PEAK also made lighting provision in the 'Library' for Primary School classes. It's wonderful to start class on a winter morning, turn on the light and have the children bow their heads to give thanks to 'Bhagwan' for having light ... or cheer! And at the end of our stay in Jatoli householders came to us in a steady procession with bags of 'chim' (red kidney beans) from the fields for us to take home to Khati (so much so the goods necessitated a mule to Khati and a tin trunk purchase for storage!). It was innocent actions like these we found touching. Throughout this (and prior) projects PEAK has developed a strong community network within Khati and now the region that has led to a solid understanding of the issues facing those in remote Himalayan locations. This will enhance on the ground solution to everyday needs in future projects.